Definitely nice location near Burger King and the Life Cinema at central point which is taxi fare of 2 dollars (depending on the taxi company). The taxi fare from the hotel to the Namaka was around 10 dollars. Their swimming pool is great !!! The staff are friendly. 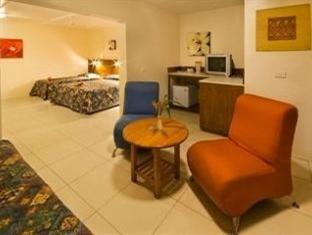 I have not lost anything in this hotel compared to other hotel in Nadi, which is very good. It shows that we can trust this hotel and its staff that we are safe and secure. Totally, I am gonna recommend it to my friends travelling there but make sure you booked the rooms near reception because it would be a long walk to other rooms way at the back, especially for the eldest people. Good for the young people though to exercise to and fro. However, there were no performances and special treats on Christmas and new years day other than other hotels that I been in. Overall, it was a good stay for a peaceful family trip. We booked the hotel to stay as an overnigth stay from the islands and the flight, do not expect to much, we came late at night and depart early in the morning, so we really did not have the opportunity to enjoy the hotel, it is basic and ok for place to sleep. that is all. My stay was ok- only 1 night after the islands hopping. 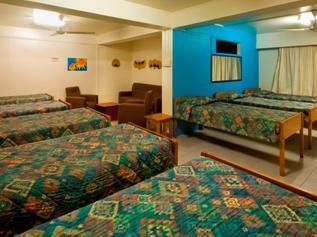 Room is very old- pictures on the website are very deceiving. Pool is nice and other facilities are ok. Outside feel like a 3-star hotel.. but inside the room, it's more like a 2 stars. Not sure I'll come back. Room is VERY old and furniture is broken. Bed is Soft and breakfast is just toast, fruits, and tea-- very basic. Plus, you'll need to pay for wifi card- expensive though. I think the only thing I like is the pool which is nice and it's location that just 10 min walk to supermarket. We stayed one night in a Dorm. No one had told us about the free shuttle from the airport so we had to make our own way there. The lady on the desk (as were all the staff) was absolutely lovely. She was very helpful and surprised that as a couple we would entertain the idea of a dorm. I can only assume this meant she put us in a dorm with just us! Very sweet. We ate in the restaurant as we couldn't see anywhere near by to go and the food and service was great. The breakfast was toast with jam/peanut butter, a plate of fruit and tea/coffee and orange juice. There was a mix of age ranges and types of travellers at the resort which I like. It was perfect for our needs. This place was recommended by one of the workers at Mana Island Resort. 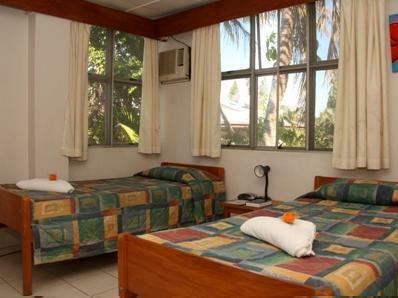 We needed a place to stay for one night before we headed back to Nadi Airport the next evening. Like the other reviews, this is a good base before going to the islands or going to the airport. At most I would stay two nights but not more than that especially after staying in other resorts off the Coral Coast and staying in Mana Island. The plus side of this place is that their evening restaurant, Antoinette's, serves absolutely delicious food! Amazing mahi mahi served in coconut cream and homemade ravioli. This food was way better than all the other resorts I've stayed at. The pool was pretty simple but it is surrounded by mango trees. One of the staff members gave us a mango from the tree and it was delicious! We ended getting a couple more. Another good thing about this place is that it's close to other restaurants and the supermarket. The staff was really helpful to book us a day tour to the Sabeto Mud Pool and Hot Springs, Garden of the Sleeping Giant and lunch at a local village before catching our evening flight. Mike, our guide, took care of our luggage and drove us to the various sites as well as take us to the local market to get Kava and then took us straight to the airport. It cost $120 FJD each. (Cheaper if you book directly at Fiji Eco Tours. Ask for Mike.) Tour was well worth it especially since we didn't want to figure out public transportation this time. The lunch at the village was delicious as well! It even included a Kava ceremony. I would totally recommend the day tour. Only suggestion for the hotel would be to add safety deposit box to each room. They had two storage rooms: one for valuables and one for misc. but no individual safety deposit boxes in the rooms. Quite weird. Also their toiletries are cheap so be sure to bring your own. Staff were very friendly and helpful. The chef - Brian was excellent cook and location was central. My stay was only pleasant due to friendly and helpful staff.The rooms were clean but conditions of showers etc were very poor. The chef and food was above the 3 star standard- excellent! 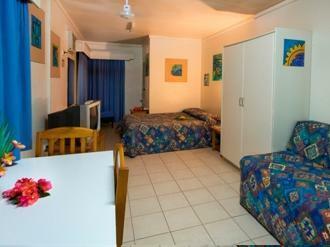 After several changes to the rooms due to ants finaling was given a decent room.Though it was 3 beds apartment. The Internet was very very expensive! And it would have been good if th restaurant and breakfast place we're air- con' If the place was up graded it would be 4/5 star.But the staff made my stay very pleasant! They were excellent and the manager is superb.Credit to them! This hotel is close to some restaurants and a supermarket, it is convenient to approach city center or airport either by taxi or bus. 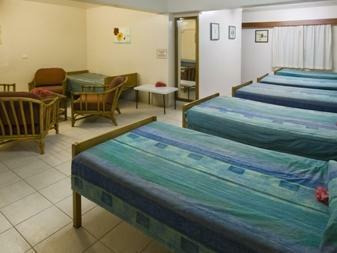 The staff are friendly, the value is worth to stay for short term stay. My room - room nr 2 - was really noisy. It was right next to where the band was located in the resto. They played until midnight on a weekday. It was like they were playing inside my room. Really noisy. I ate in their resto and the food was amazing though. Good standard hotel with really friendly and helpfull staff. We stayed 1 night before going to the islands. Dinner was good and price was reasonable. Would stay there again for a stopover. Hotel taxi is adviseable. There are two restaurants on the property. Breakfast is served in one; the other is a bar with an ample menu. Prices are decent! Breakfast was fresh fruit, toast with jam/peanut butter, tea/coffee/juice. 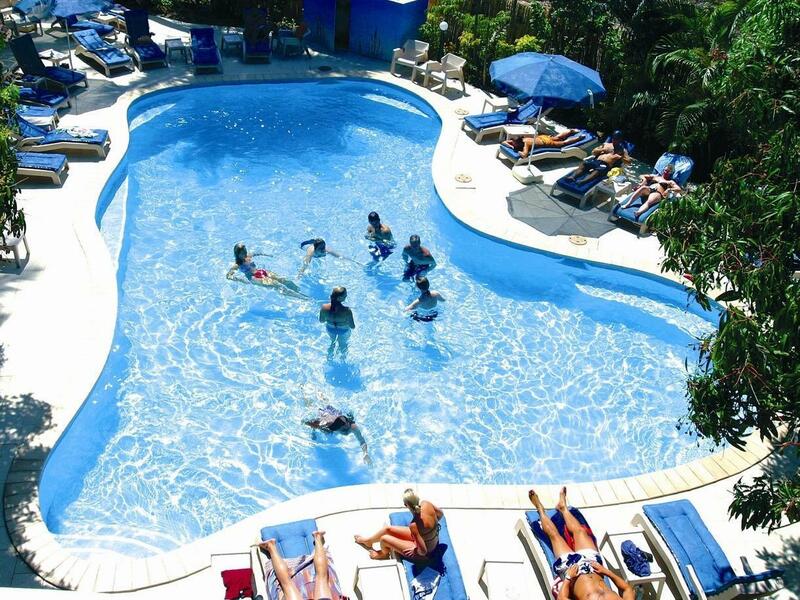 A relaxed atmosphere right by the pool. Two pools on the property. 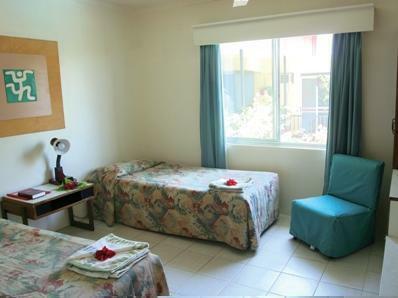 The property is very well maintained (pool is cleaned each morning). Rooms are sufficient. Older comforter, but clean. It was about a 10 minute drive to Nadi Central, and a 20 minute walk to the beach. Not much surrounds the hotel. It's about a 3 minute walk to the bus stop, though, and buses are < $1 each way to Nadi.